The popular midsize crossover returns with some styling tweaks, including upgraded interior and technology features. Nissan’s five-passenger midsize Murano crossover returns for 2019 with a “freshened” exterior design and some new premium interior features, along with additional safety and driver-assistance technologies. Styling tweaks include a new, bolder V-motion grille; restyled LED headlights (now standard) and LED taillights; and new 18- and 20-inch wheel designs. But the changes are not dramatic, so it’s still clearly identifiable as a Murano — continuing the unique edgy styling that has always set this vehicle apart from its competitors. 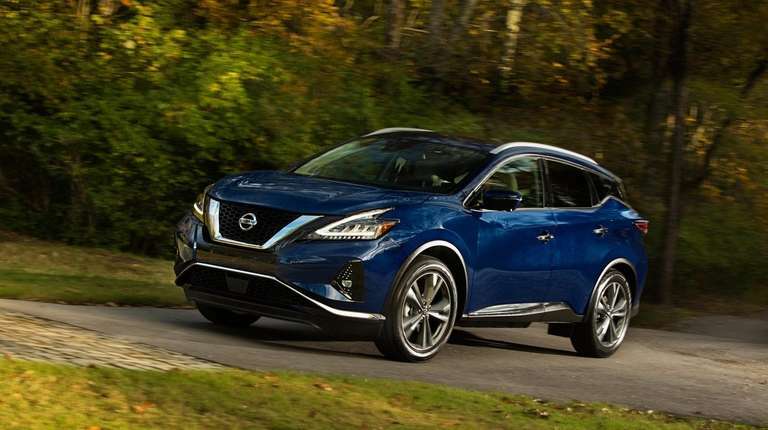 The 2019 Murano comes in four trim levels, starting with the base front-wheel-drive S ($31,270 plus $1,045 freight), followed by the front-drive SV ($34,440), our tester for this report; SL ($39,230); and Platinum ($43,530). All-wheel drive can be added to any trim level for an additional $1,600. Murano’s interior was designed to give occupants the feel of an upscale social lounge, Nissan says. To help with that, our SV model came with comfortable brown leather seats, with buckets up front and a three-person bench in the rear. We had heated front seats with eight-way power adjustment on the driver’s side, and four-way on the passenger’s side. The steering wheel and shifter were leather-wrapped. Remote entry with pushbutton start was included, along with dual-zone automatic climate control, a seven-inch in-dash DriveAssist display above the steering column, and a driver’s side memory system for outside mirrors and seat position. Originally introduced for 2004, the Murano’s name was taken from a style of fine Italian glass. It fits into the Nissan crossover lineup between the compact Rogue and the larger, seven-passenger Pathfinder. Rogue and Pathfinder are assembled in Tennessee, while the Murano is a product of Nissan’s Mississippi plant.